The death of a family member, parent, spouse, child or loved one is never easy and is the most traumatic event in most of our lives. If the death is the result of being killed from an accident, the loss is sudden and devastating. In addition to the pain, grief and emotional loss, family members must deal with moving into the future without their loved one. Wrongful death cases can occur as the result of medical malpractice that results in death, dangerous or defective products, car wrecks, trucking accidents, airplane accidents, work-related accidents, toxic exposure, pharmacy prescription error, use of defective products or drugs, death during a supervised activity or someone else’s carelessness or negligence. The death of the family member leaves the family not only with the emotional loss but financial loss as well which include medical bills, funeral bills and loss of support and wages (lost pension, salary, health insurance benefits and other benefits). When a family member dies as a result of the negligence of another person or corporation, the surviving spouse, parents and children may be entitled to benefits through a wrongful death claim. A wrongful death lawsuit is a legal claim brought by family members as a result of the death of a loved one or someone who supports them financially. Every state has different rules and regulations regarding wrongful death lawsuits, including who is eligible to make a claim and what benefits may be obtained. In Texas, the surviving husband or wife, children and parents can sue to recover the losses that have resulted from the death. When the family member’s death is caused by negligence, the surviving family members can bring a wrongful death lawsuit to recover damages for their loved one and for the statutory benefits. The Texas Wrongful Death Statute creates two types of claims: survival claims and wrongful death claims. 3. Funeral and burial expenses. Wrongful death claims are made by the surviving husband or wife, children and parents for their loss of “companionship and society” and “pecuniary loss” in Texas. Pecuniary loss means the loss of the care maintenance, support, services, advice, counsel and reasonable contributions of a pecuniary (money) value. All of these losses are taken into account and may be recovered in a successful wrongful death case. Jimmy C. Bailey is prepared to bring forty successful years of ability, expertise, resources and strive to make sure you and your family receive the compensation and justice you deserve. 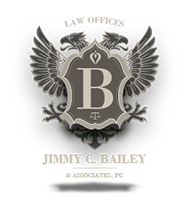 At Jimmy C. Bailey & Associates, we know and understand the law and treat each client and their case with skilled, compassionate understanding and provide a background of aggressive representation.